The first 3 hit hard and fast and consist of a Sterling Hayden triple-header. The line-up begins with The Killing, Stanley Kubrick's knock-out caper film previously recommended here. It starts the crime spree Wednesday, May 6 at 5pm PST. 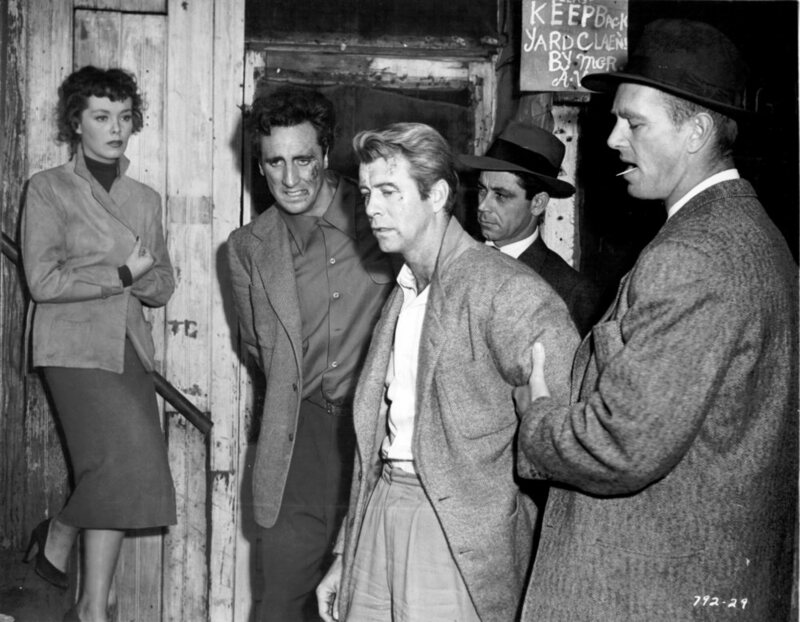 Immediately thereafter is the film that began the international heist movement, The Asphalt Jungle also previously reviewed here, airing 6:45pm PST (Wednesday, May 6). For the last of tonight's noir triple-threat, Hayden jumps the fence: Unlike the hardened criminals he portrays in the two previous films, Crime Wave's Hayden has him playing hardened cop Det. Lt. Sims. He puts the squeeze big time on parolee Steve Lacey (played appropriately close to the vest by Gene Nelson). Sims hopes to catch three recent prison escapees and suspects they'll try to contact their former big house buddy Lacey and is he right! One of the imposing bad guys has a gunshot wound plus ringleader 'Doc' Penny has a new caper all planned and will threaten Lacey with his wife's safety if he doesn't help out. This puts Lacey, who's trying to go straight, in a real bind because if he does, he'll go back to prison and if he doesn't, his wife will most likely be killed. This is solid gold noir: Seasoned and determined tough guys on both sides of the law with our hero caught in the middle. When a final bank heist takes centre stage, the suspense ratchets up, with our sympathetic ties to Lacey tightening as well. The tension builds to a surprising but welcome conclusion with the multidimensional cop Sims' final response being a bonus surprise for this genre. The director is ace craftsman Andre De Toth who excelled with westerns (The Bounty Hunter, The Indian Fighter), films noir (Pitfall, Dark Waters) and noir westerns (The Day of the Outlaw, Ramrod), completing this tight little thriller's shooting schedule in a record breaking 13 days! Aside from a few recognisable faces from The Killing like Ted de Corsia and Timothy Carey, there are also vivid well-rounded characterisations provided by actors Phyllis Kirk, Charles Bronson, Jay Novello and Dub Taylor amongst others. Crime Wave will hit (updated) Wednesday, December 5 at 9am PST. My next TCM recommendation is The Ascent a.k.a. Voskhoz hdeniye (1977, Soviet Union). This is not only a rare foreign film broadcast for TCM, it's a rare foreign film, and presents a precious opportunity to witness an exceptional work of art from Russian director Larisa Shepitko, the story of which occurs during WWII. Be warned, The Ascent is a violent, astonishing tragedy of biblical proportions but rewards viewers with an underlying spiritual strength like nothing ever seen before on the silver screen. Hidden Gem #3 is scheduled to air on (updated) Sunday, November 20 at 12:30am PST (technically Monday morning). TCM's current monthly schedule can be confirmed by clicking on the above image. For those who live in parts of the U.S. other than the western region, the time zone can be adjusted in the upper right-hand corner of TCM's programme. The next recommendation is another Hidden Gem (#40: Big Business 1929, U.S.A.) but has a completely different nature than the previous one: A Laurel and Hardy film in which a war does take place but instead of resulting in tragedy, all out hilarity ensues. Stan and Ollie are Christmas tree salesmen who pick the wrong customer (James Finlayson) to call on and the situation escalates from a simple misunderstanding to total annihilation. This is probably the duo's funniest film of all and is only 19 minutes in length, airing (along with some other Laurel and Hardy shorts) Sunday, May 17 at 9:15pm PST. The final TCM recommendation for the month of May is Robert Altman's wild take-off of a well-known literary L.A. private detective of the 40s transposed to the chaotic and narcissistic world of the then contemporary 70s: The Long Goodbye. Elliot Gould plays Raymond Chandler's Philip Marlowe unlike any actor has in the past: He's unkempt, makes goofy faces and seems purposely out of touch with reality, possessing a kind of witty sarcasm toward those he encounters, repeatedly saying "It's okay with me." I can see how if one expects this character or his reactions to be anything like past Marlowe's (in book or film form) they can be hugely disappointed. I recall vividly the two completely opposing views of this film by esteemed L.A. Times film critics Charles Champlin (See: End Credits #25), who vehemently disliked The Long Goodbye and Kevin Thomas, who enjoyed it, basically resting on this same premise of expectancy. Champlin even said as much when he spoke to me about the film in person. Personally, I love The Long Goodbye but then I approached the film on its own terms with no previous expectations finding it fresh, fun and engaging. Criticisms for a lack of faithfulness to the genre, character or novel are apt. For bad direction, character continuity etc. they’re not. This is practically a parody of noir conventions while still honouring them. As to an even more controversial ending, its surprise final moments fit like a glove, as long as you perceive the events through Altman's Marlowe instead of reverting to Chandler's. Keep in mind, this is a guy who is used by practically everyone he meets and that final insult on top of personal betrayal proves too much for him to shrug off as he typically does the other admonishments received throughout his investigations. Before the resolution, however, there's Altman's crazy world of remarkable and eccentric characters engaged in some recognisable L.A. situations (albeit dramatically enhanced) both intriguing and incongruously humorous. The screenplay of Chandler's novel is by noted screenwriter Leigh Brackett and again, it's quite a departure from past Chandler film adaptations (including Brackett's own 1946 The Big Sleep) but creatively balanced between authenticity and irreverence. Plus there's Sterling Hayden who once again scores a knockout performance. As long as viewers can watch The Long Goodbye afresh, they'll have a great time. It arrives Wednesday, May 27 at 8:45pm PST. May’s Soundtrack recommendation is Jerry Goldsmith’s exciting, Latin flavoured composition to Under Fire, one of the most well crafted films he scored. His music is boldly thematic, rhythmically infectious, and held in high regard as a self-contained work. Goldsmith's popular music can be heard periodically in trailers for other films and is prominently featured in Quentin Tarantino's Django Unchained. In addition, it highlights the virtuoso guitar playing of Pat Metheny. The soundtrack has been issued by Film Score Monthly and is a limited edition. More information about the score, MP3 samples, and ordering details are available from Screen Archives Entertainment by clicking on the image. A most sincere Happy Birthday to that great dramatic actor Don Rickles who turns 89 on May 8th! He “carried” Clint Eastwood in Kelly’s Heroes and Robert De Niro in Casino (or so he says) and let’s not forget his substantial performances in Run Silent Run Deep and X: The Man with the X-Ray Eyes! Oh, and he can be funny too. 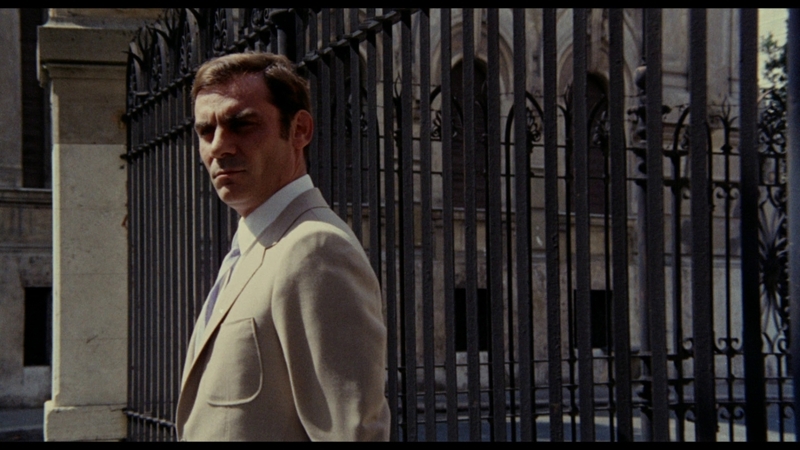 This month's video recommendation is Investigation Of A Citizen Above Suspicion a.k.a. Indagine su un cittadino al di sopra di ogni sospetto (1970, Italy). Hidden Gem #13 is a highly distinctive portrait of a police chief so obsessed with power, he's willing to kill his girlfriend just to challenge his subordinates to identify him as the murderer! Visually stunning, there's a score by Ennio Morricone perfectly matched to the elliptical imagery in driving energy. The Blu-ray by Criterion is Region A (North America) locked and is a superb transfer. It can be ordered from Amazon U.S. by clicking on the image.